There are MANY reasons Why You should study Karate Online! 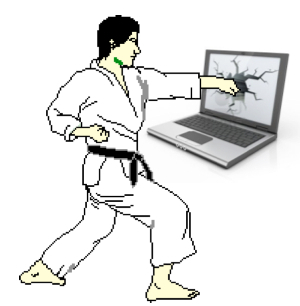 First, it is convenient to study karate online. You don’t have to get in the car, drive across town, park the car, walk across the street, change clothes…and so on. Simply, you save time and gas and inconvenience. Second, you can take classes whenever you want! You aren’t limited to a set time on Wednesday night, but you can fire up the computer, take the notebook out to your garage or backyard, at ANY time of the day or night! Third, you can go as fast or as slow as you want to! You don’t have to wait for the slower students to have things explained to them, and if you are having trouble with something, you aren’t going to be slowing everybody down! Fourth, you can have a lesson every night, or even twice or thrice a night! There are NO LIMITS on you! Fifth, you can choose the people you want to work out with. You can call your best friend, and he can study with you for FREE! Sixth, you can make sure you don’t miss anything! No more missed classes, and you can play the lessons over and over and make sure there is NOTHING you don’t understand! Seventh, if you have a question, shoot me an email at aganzul@gmail.com. I work on the computer, and I will get back to you with a no bushwah, totally accurate answer that makes sense! Simply, you are going to find that this Karate Course, the Best Online Karate Course in the World, is going to be the best thing you ever did! learn REAL self defense that can be used on the street! actually learn something that will make you a better person! and more. A lot more. That said, I always recommend that you take advantage of real classes. Simply, the more people you work out with, the more varieties of bodies you will be able to defend yourself against. Besides, you’re going to find that the brotherhood of Karate is something that will stay with you for life. You will ALWAYS remember the people you meet on the mat. Faces comes and fade…but you won’t forget your fellow Karate students! You can continue browsing through this site, here is a short history of the Kang Duk Won, or you can go to this page and sign up for The Best Online Karate Course in the World! I have been studying the Matrix Karate and the Kang Duk Won for about a year or so. Mostly by myself, occasionally with a partner. The most impressive thing about these courses is the scientific method in which the forms, apps and concepts are presented. If you want to know the foundation of the system just read the Master Text and the Master Instructor Course. These books are sheer genius. When in use with the video instruction and the relaxed but disciplined method of teaching. The forms energy patterns are clearly laid out. Truly, this an exceptional course. In Matrix Karate you can see the evolution from its foundation, which is Kang Duk Won, into a Scientific Method of teaching. Straight forward and with precision. Definitely the continuation of the concept founded in that simple term, Kwon Bup American Power. You’re a real deep thikren. Thanks for sharing.